I woke up this morning craving a breakfast like I would get in a restaurant, so I came up with this breakfast bowl. And it was better than a restaurant! I used veggies from my garden YUM! And it was obviously nowhere near as damaging as what a restaurant would serve. Best of all, it just tasted so good! At the last minute, I decided not to add cheese, and I’m really glad I didn’t. The luscious yolk from the over easy egg pulled it all together perfectly! In a medium skillet, preferably cast iron, melt the butter. Add the potatoes in a single layer and cook on medium-high heat, stirring occasionally until potatoes are browned and cooked through. Season well with salt, pepper, chili powder, and Old Bay (a good pinch of each). Heat a medium, nonstick skillet on medium-high heat. Cook the slice of bacon, turning often, until lightly browned and crisp. Remove the bacon and set aside. 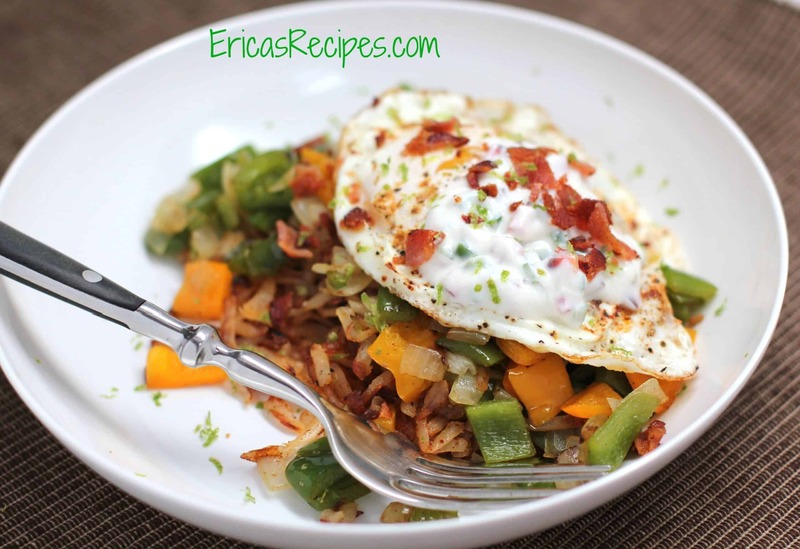 In the same skillet, with the bacon grease (add cooking spray if there isn’t enough fat from the bacon to lightly coat the pan), cook the bell pepper, poblano pepper, onion, and half the jalapeno, until the veggies are softened and slightly charred. Season with salt and pepper. In a small, nonstick skillet sprayed with cooking spray, cook the eggs over easy. Season with a pinch salt and chili powder. In a small bowl, combine the sour cream with remaining jalapeno and the lime zest. To assemble, divide the potatoes between 2 bowls. Top with the veggies, then an egg. Place a dollop of jalapeno sour cream and sprinkle with crumbled bacon. Serves 2, but this recipe can be easily doubled. Here are my garden veggies 🙂 I say 1 bell pepper in the recipe, but have two below because they’re so little. I love the look of this breakfast bowl! Mmm, it looks so good! As soon as my parents bring me some produce from their garden, I will have to make something like this! I found your site thru pinterest, this recipe looks so good!